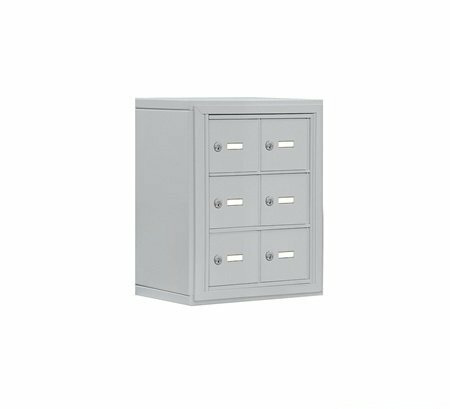 Salsbury 19000 Series Cell Phone Lockers - Surface Mounted are ideal for use in health clubs, government facilities, office buildings, schools and other settings where small personal items need to be stored safely and securely. Units accommodate cell phones, keys, wallets, cameras, tablet PC's and other valuable items. Made entirely of heavy duty aluminum. Feature a durable powder coated finish available in aluminum, bronze, gold and sandstone. Available in three (3), four (4), five (5), six (6) and seven (7) doors high and two (2), three (3), four (4) and five (5) doors wide with standard "A" size doors (6-1/2" W x 5-1/4" H) and larger "B" size doors (13" W x 5-1/4" H). Available in 5" and 8" deep compartments. Mount directly to a wall and are secured with mounting hardware (not included). Each cell phone locker door includes a 2" W x 5/8" H clear plastic cardholder (card included) to identify the compartment. Cell phone lockers are available with master keyed locks or resettable combination locks. Master keyed locks include 3 keys and allow access to all compartments with a master control key. Resettable combination locks can be set to a fixed combination or a combination that can be reset after each use. A master control key is available for resettable combination locks that will override the combination and open the locks. All openings are usable. Salsbury Industries is an ISO 9001: 2008 certified company and has excelled in the field of manufacturing since 1936.